A local woman escaped unscathed after a large branch crushed the back half of her SUV in northwest D.C. Thursday morning. Carolyn Baker told News4's Megan McGrath she was driving in the 1700 block of Constitution Avenue NW when the scary situation unfolded. "I was on my way to work, and I heard a crunch. My car stopped, I got out and realized a tree fell on my car," Baker said. 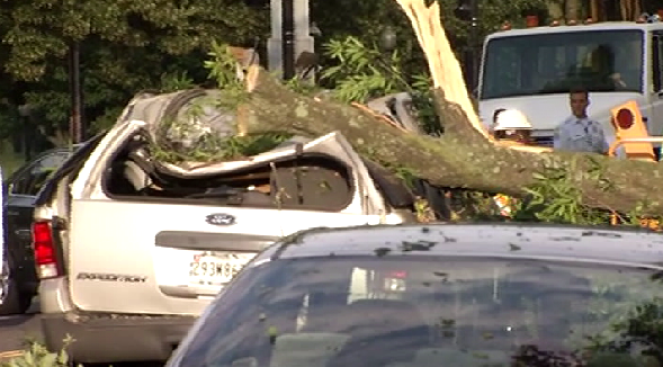 Veda Allen was driving behind Baker when the branch came down on Baker's SUV. From the damage to Baker's car, Allen feared someone inside may have been injured. But that was not the case. "When I walked around there, she was standing outside, and I was just happy she was alive," Allen said. " I've never seen anything like it before." "I'm not lucky; I'm blessed," Baker added. All lanes of Constitution Avenue have reopened.